Unpacking all that celebrity wattage, in order of appearance. For his Karena Evans-directed "Nice For What" video, Drake enlisted a cavalcade of powerful women. One thing that most of them have in common is some type of connection to the 6 God. We've broken down each of the cameos, in order of appearance. Olivia Wilde first got a shoutout on Drake's remix of Partynextdoor's "Freak In You," with "we can get wild like Olivia." She was initially turned onto his music by none other than Jason Sudeikis. Misty Copeland once said that she warms up for ballet performances with Drake's music. Issa Rae endorsed Drake's DJ set at a Golden Globes afterparty, saying "he was a phenomenal DJ. He played all the correct tracks. The playlist was simply...correct. So I'm pleased." Rashida Jones is a noted fan and friend of Drakes, and vice-versa. He once told Complex "I was, like, in love with Rashida. I love funny women and I love beautiful women and I love women that have great taste in music and Rashida is all those things," Plus, she's got the "Hotline Bling" dance nailed. Jourdan Dunn and Drake have been photographed at events together. Tracee Ellis Ross's cover of "6 God" nabbed her a marriage proposal from Drake. 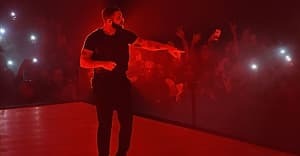 Tiffany Haddish once got pissed when Drake's concert started late, and documented the whole thing on her Instagram. It's safe to say they're cool now, though. Yara Shahidi was a big fan of Drake's grand gesture to Rihanna, when he rented out a congratulatory billboard back in August 2016. Zoe Saldana and Drake haven't publicly geeked out over each other as far as we can tell, but hey, that's what tonight is for. Elizabeth and Victoria Lejonhjärta famously appeared in the booklet for Views. Letitia Wright gave Drake a shoutout in a recent TimeOut interview. Bria Vinaite tweeted an adorable selfie with Drizzy, who was a huge fan of her movie The Florida Project. Emma Roberts was once on Drake & Josh. That's all we got. Syd once told i-D in an interview "I think I'm influenced a lot by Drake in specific ways in my writing." Michelle Rodriguez and Drizzy once reportedly partied together at Up & Down with the likes of Rihanna, Leonardo DiCaprio, and Naomi Campbell.